Utah State University Press. 2016. 80 pp. 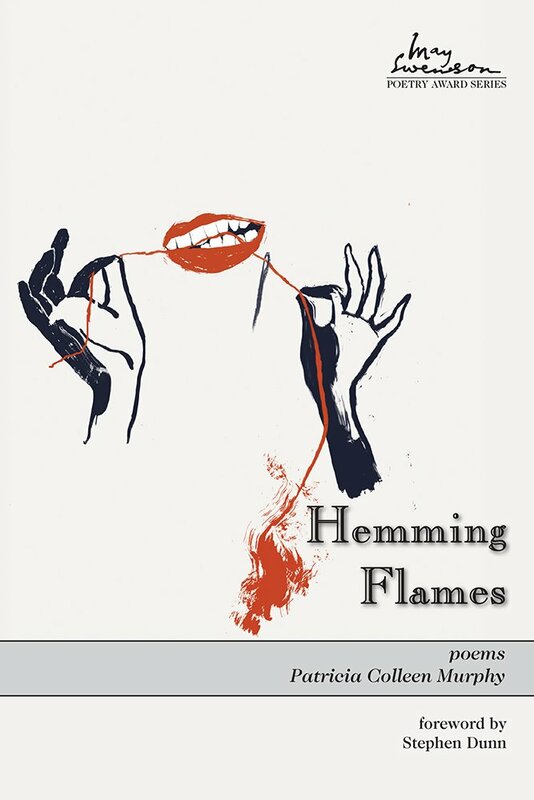 Patricia Colleen Murphy’s first collection, Hemming Flames, is an intricate and intimate portrait of family, struggle, grief, guilt, and moving through it all. It’s a book about feeling strange—not part of the family you were born into, and not really part of yourself—with the body you were born into. It’s a book about trying to find shreds of certainty, and about trying, period. In “Crushings” Murphy writes about standing before a garbage truck making its rounds: “I watch the things / I did not want / pressing hard against / all the things / no one else wanted” (p. 57). From the lyrical search for meaning present within individual poems to the impact of the accumulation of poems, Hemming Flames is a collection that presses hard against itself, and ultimately presses hard against the question of what it means to be alive, and what it means to be alive amongst the things that pain us most–the things we may not want. on the front porch with baby me. are almost the same size. to find and clean the afterbirth. In searching the figurative house of memory and the literal houses she inhabits, Murphy writes through the fog to make amends (of a sort), or perhaps to shuffle the contents of a life as if they were objects on a desk gathering dust. And the afterbirth, if we think of it in terms of a state (after birth), is one we are all familiar with. That is, the lived experience of being part of—sometimes painfully part of—a family. Murphy’s own honest telling provides a mirror and a clean slate; self-reflection for writer and reader alike happens between the lines and pages. Look up and the contents of your life may be somewhere other than where you left them. In “Take The Late Flight” the narrator asks, “So what am I to do now?” then arrives at her answer: “Rearrange it. Rearrange it” . At once a gesture toward the articulation of the role of the writer, these lines also speak to surviving hardship. Sometimes it’s necessary to rearrange the contents of a life in order to—not rewrite them so much as to see them more clearly. Although in “Midnight At Orca Cannery,” Murphy writes, “What does breath offer? / Only fog” , her collection charts a course (in the spirit of the Robert Frost sentiment, “The best way out is always through”) not through the fog (as in past it), but through it (as in amongst it). As the individual poems in the collection physically accumulate, so too do the individual portraits of family members struggling in their own particular way(s). And there’s a physicality present in the poems themselves, too. That is, violence lived becomes violence on the page. Heads smash through cabinets. Ashtrays fly across the room. There are blue volts, flames, skin grafts, pills. Throughout the course of Hemming Flames these moments blur and the collective image we’re left with is one both entirely unique and one many can relate to: that of a family who can’t, to paraphrase Murphy, coordinate their agony. But the collection moves beyond its own brutally honest telling of family hardship. Its power comes, in fact, from the tenderness and humor it finds amongst a seeming house of horrors filled with an odd cast of characters. In a handful of poems, Murphy conjures the images of her deceased parents when they were young. In another, she writes, “I understood exactly why you needed to touch me that way” . And in another, she affords herself this same kind of tenderness, speaking about how the summer her mother died she “went to the garden […] I did the digging with my / two hands. With my two bare hands” . A theme of the collection is that of the house itself and the home as an idea. There is a searching for belonging amongst spaces that run the gamut from the dim-lit domesticity of Murphy’s childhood home in suburban Ohio, to the far flung places she travels throughout the world (the Andaman Sea in Phuket, the summit of Kilimanjaro, riding the subway in Czechoslovakia), to the many asylums her mother inhabits, to the imaginary condos she remodels in her imagination. These various structures and places become characters, representing all that is simultaneously longed-for and abhorred, concealed and revealed, escaped from and returned to. Although in the beginning of the collection we see the narrator leaving the “house of faulty methods,” the rest of the collection—its making and its physicality— are a gesture toward the very opposite of a disappearance. Rather than leaving, the collection makes a home within the walls of the “irrevocable after” of being born into a family. It insists on not leaving anything as it is, toying with the particular and acute tension that it creates. True to the title, the poems in this collection hem the flames they invent. Carly Fraysier earned her MFA in Nonfiction from the University of Wyoming. She was a finalist for the Missouri Review’s 2016 Jeffrey E. Smith Editors' Prize. Her writing has appeared in Western Confluence Magazine, and has been recorded on Wyoming Public Radio’s Spoken Words.She accounts for one of the twenty-five people living in Ucross, Wyoming. Congratulations to GMR contributor Barbara Murphy!